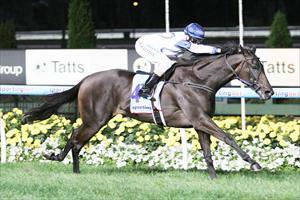 Gutsy mare Placement is doing her best to shed the tag of non-winner after an impressive victory at Moonee Valley on Friday night. The daughter of Savabeel proved far too strong for her rivals in a mares' restricted 0-89 event over 2040m thanks to an excellent ride by apprectice Katelyn Mallyon. The win was her second this campaign and her third in a 32-start career. Trainer, and part-owner, Danny O'Brien was thrilled with her victory and lauded Katelyn's patient ride. "Katelyn ride was terrific, she showed great poise to wait to make her run as this mare has only a short sprint. She is a very talented rider with a big future," O'Brien said. Friday night's win took Placement's prizemoney past $350,000. "She is such a tough filly that thrives on racing. She has been up a long time, but throughout her career she has been honest and she hasn't put in a poor performance this campaign," O'Brien said. O'Brien said the mare's size held her back from reaching even greater heights. "If she was a hand taller I am sure her record would be even better, but having said that she won three and placed 15 times from 32 starts for more than $350,000 in prizemoney so she hasn't done a bad job," he said. Placement was placed at Group 1 and Group 2 level as a three-year-old and has a strong pedigree which makes her a valuable broodmare once her racing career finishes. "While she is enjoying racing we will keep her going as she still has plenty to offer."